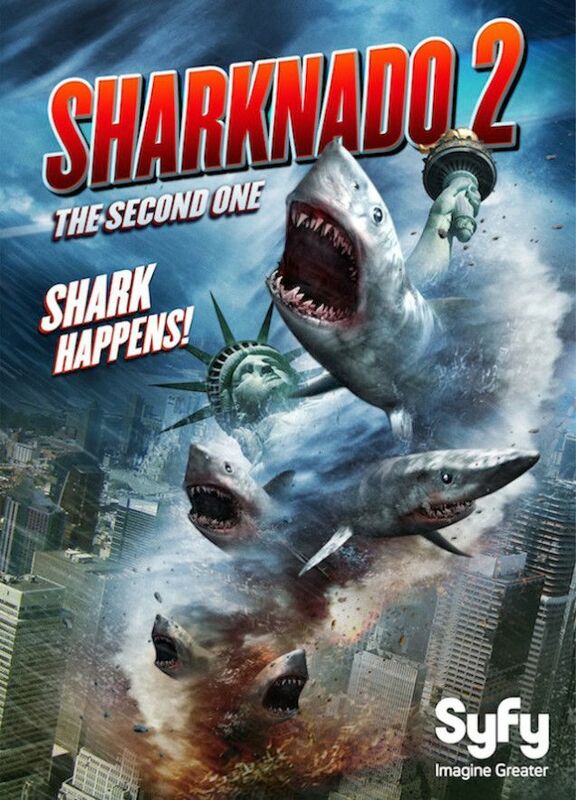 Geek (Made for TV) Cinema – Sharknado 2: The Second One! “It’s happening… again.” Potato salad aside, nothing has taken the internet by storm quite like last year’s surprise hit Sharknado. B-List actors, campy dialogue, effects worthy of Indiana Jones’ Crystal Skull… (Too soon?) A laundry list of terrible qualities seemed to form “the perfect storm” of a TV event. Now, the question remains – can lightning (or other unlikely weather events) strike twice? 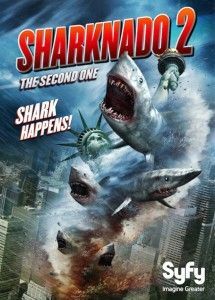 Sharknado 2: The Second One (yes, that it really the full title of the movie) finds our unlikely hero Finn on his way to New York with his soon to be ex-ex-wife, April. (They’re getting back together.) An enthusiastic flight attendant asks the couple to sign her copy of the hot bestseller “How to Survive a Sharknado”. (Side note – this book actually exists, and it is fabulous.) April obliges, but Finn begins to grumble. “I was eaten by a shark – how much fun do you think that was?” As the plane prepares for landing, they encounter some weather-related turbulence. Finn looks out the window, only to see a shark on the wing of the plane! He does a double-take – is he the only person who sees this?! Is he going crazy? He attracts the attention of the air marshal, who gives Finn a stern warning to take it down a notch. However, Finn is not hallucinating. Chaos ensues, resulting in an emergency crash landing at JFK airport. of Liberty, and even taking the subway. 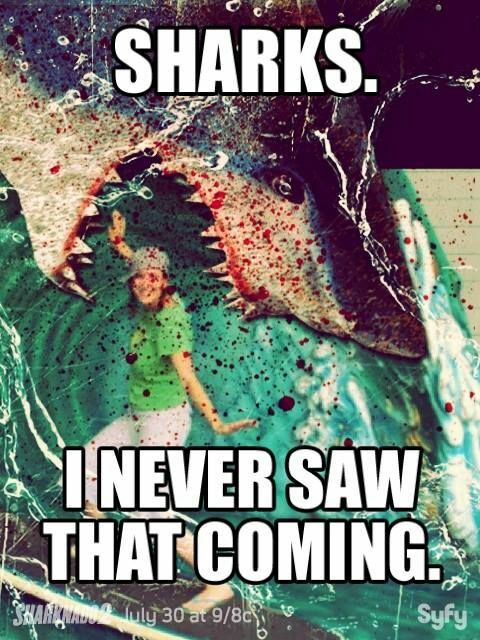 However, the self-proclaimed Sharknado expert Finn realizes that he can’t just use the same solution as last time. “Even the sharks are tougher in New York.” Naturally, a new scheme (ignoring logic and science) is born, and the city is saved. g, straight up awful effects… who would willingly sign-up for this torture? Judging by the number of celebrity cameos in The Second One, there are many folks who love this cheese-fest as much as I do. Fans of Mystery Science Theater (and more recently, RiffTrax) understand that sometimes the entertainment value is in the simplicity of the story. And within that simple (read “pretty terrible”) story, you find the comedy and the punch line. Sharks + tornado = Sharknado. Seems like a fairly basic concept. There have been real-life reports of wildlife falling from the sky (folks who’ve seen the movie Magnolia – you know what I’m talking about). Ok, so crazy weather, plus sharks… The real prize is the realization that the characters believe the best way to fight this phenomenon is with chainsaws and homemade explosives. Seriously?! Who WOULDN’T want to see that? Maybe it works, maybe it doesn’t, but something crazier than sharks falling from the sky is going to happen along the way! “Holy shhhhhark!” You have to see this movie. Mel Lang is a “Book-ologist” (yes, that’s really how her name tag reads) in Topeka, KS. Before moving to Topeka, she managed a comic book store in Wichita, KS for seven years. Leaving the industry was tough, but she is now perfectly content just being a reader and a fan. She lives in Topeka with her husband, Matt, and their spoiled but lovable black lab, Phog. I loved this movie for all the above reasons! It was so bad I couldn’t help but to enjoy it. I think one of my favorite little cameo’s was Wil Wheaton’s and an honorable mention goes to Kelly Ripa for her awesome skills with those heels!